I landed on Quebec’s Îles de la Madeleine (sometimes called the Magdalen Islands) with an empty stomach eager to hit the Circuit des saveurs (flavor trail), a consortium of nine agricultural producers working to improve the island’s economy. Driving along the narrow highway 199 (and short, at only 100 km long) pastel-clapboard homes dotted grassy fields and white sand beaches ringed the coastline in every direction. There were five islands connected by causeways and bridges, and another by ferry, all waiting to explore. Was it possible they were also connected by food? For decades the islands 12,000 residents made a living from fishing and hunting seals. With the decline in fish and public disapproval of the seal hunt, the focus on tourism has increased. “It (the flavor trail) has been many years we have had the idea. It’s a way to work together, to build something stronger than individual businesses,” explained Tourism Îles de la Madeleine’s Marie-Christine Leblanc. I warmed up my taste buds with a stop at Fromagerie du Pied-de-Vent – a cheese factory and store. Across the road I watched over thirty cows of various shades of brown grazing. They were Canadian cows – the oldest breed of dairy cow in North America – and the first cows to come to the archipelago. I stepped into the shop where a man dressed from the top of his head to his feet in white studied a piece of cheese behind a plate-glass window. Being a Quebec économusée® as well they showcase their knowledge and craftsmanship as well as selling food. I took a sample of Brie cheese, its creamy texture oozing across my tongue. I bought a bag of cheese curds for snacks later but discovered a lack of food is not a problem in this community of three traffic lights and few chain restaurants. My next stop on the trail was the only remaining smokehouse, Fumoir d’Antan. When herring populations were healthy there were 43 smokehouses. Now there is one and its staff worry about dwindling fish population. To diversify they smoke cheese (from the cheese factory), lobster, mussels and beef. “If we don’t have herring next year, we need to have something else,” said general manager Sébastien Cyr of his need to innovate to keep 15 staff employed. I nibble at some smoked herring while gazing at the smokehouse floor where small fires are started when it’s time to smoke. It seems insane to stop for lunch after nibbling all morning but the salt air and a short walk along the white-sand beaches has revived my appetite. I head for Domaine du Vieux Couvent (the Convent Inn); the nuns left when it was converted to a hotel and restaurant so it’s now okay to indulge in earthly sins. The chef has created a Caesar salad with garlic strong enough to taste, a chunky fish chowder, and local beer is on offer. The tables are crowded with cruise ship passengers chattering about their morning’s adventures. 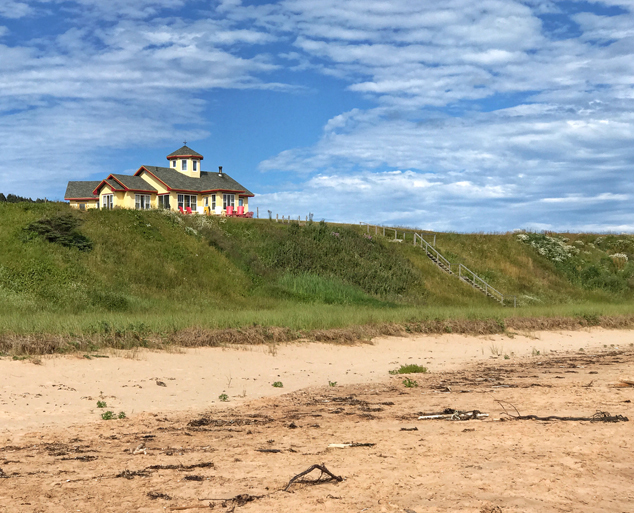 Most people get to the island by air or on a five-hour ferry ride from Prince Edward Island. I don’t drink beer but want to see the island brew so I head to another flavor trail stop, the Á l’abri de la Tempête brewery. Co-owners Anne-Marie Lachance and Elise Cornellier Bernier are “outsiders” but have been here many years, embracing the island’s cooperative spirit. The smokehouse smokes the barley used in the beer and the brassieres sends leftover barley to the cheese factory for feed for the cows. At the Fromagerie Les Biquettes À L’Air, 32 toggenburg goats on the payroll ate grass while co-owner Éric Longpré confirmed flavors on the trail blend together, “our cheese is used to top nachos at the brewery and pizza at the pizzeria.” I snap a picture of the goats before scampering to the car for one final stop. Tucked along a narrow country road, I find the small wooden shop of Le Verger Poméloi. The shopkeeper is speaking excitedly about the bottle of golden liquor in his hands to several customers, a large apple nestled below the narrow neck, sales apparently brisk. How did the apple get into the bottle? I wander to the orchard nearby. Looking closer I see glass bottles strapped to the trees over tiny apples. Mystery solved! The apples grow larger in the bottle and the apple liquor is added after harvest. It seemed island residents were good at solving problems. I left believing this flavor partnership was indeed picking up the economy. Quebec’s Îles de la Madeleine flavor trail – Click to Tweet. My friend, @Reinventure’s, latest adventure to Quebec’s Îles de la Madeleine will leave you wanting to visit & delight your taste buds! Read more in her latest blog post: Click to Tweet. My latest adventure left my friend, @Reinventure, asking how a large apple was nestled below the narrow neck of a bottle of golden liquor. Discover more: Click to Tweet.